In 1816 the U.S. Government selected and purchased 40 acres of land on the northern bank of the Charles River in Watertown as the site for a new regional arsenal. The siting, layout, and construction were supervised by the Arsenal’s first Commander, Captain George Talcott, and the buildings were designed by Boston architect Alexander Parris. The original Arsenal was composed of a group of 12 brick and stone buildings arranged in a quadrangle around central parade grounds, connected with a 15 ft. high brick wall. They included two arsenals for storage of arms and ammunition, officer’s quarters, barracks for soldiers stationed at the post, and workshops for maintaining and repairing the artillery and ammunition. 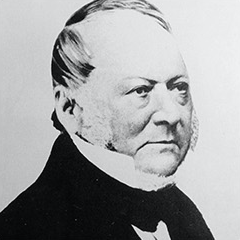 Captain George Talcott, first commanding officer of the Watertown Arsenal from 1816 to 1820. By 1863 the Arsenal had grown well beyond the brick walls of original 1816 quadrangle. From 1830- 55, the Army had added 13 acres to the grounds, a new entrance connecting the complex to Arsenal Street, two new storehouses, and a new laboratory. The arrival of the Civil War transformed the Arsenal into an important military production center. 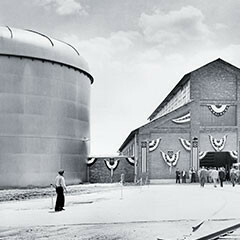 Under the direction of Commander Thomas J. Rodman, a new manufacturing complex consisting of a large u-shaped machine shop and smith shop were built to meet the wartime demand. Rodman also supervised the construction of new Officers’ Quarters and a new three-story Commanding Officer’s mansion. A natural gas works and small iron and brass foundry would be constructed on the banks of the Charles River in 1865 and 1867 respectively. 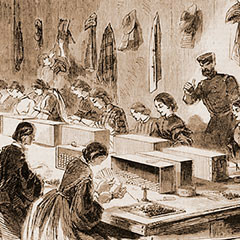 Detail of women filling cartridges from a July 1861 Harper’s Weekly cover illustration. The last two decades of the 19th century witnessed the transformation of the Watertown Arsenal into a major manufacturing and research center within the Army’s arsenal system. This process began in earnest in 1888, when the Watertown Arsenal was chosen as the site of the Army’s new gun carriage manufacturing plant. The three existing Civil War era industrial buildings on the Arsenal were updated and expanded. A new erecting shop and carriage storehouse were added to the complex to satisfy the production needs of larger and more sophisticated weapons. Guard-houses and an administrative building were also added to meet the growing security and administrative needs of this important military site. By the 1890’s iron had replaced wood as the primary material for gun carriages. 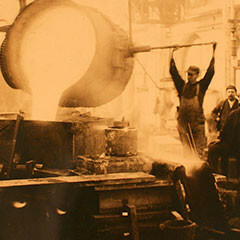 The Watertown Arsenal was home to the only foundry owned and operated for the U.S. Army by the Department of Ordnance. The importance of the Arsenal as an early 20th Century military manufacturing center is reflected in its most dramatic period of growth from 1917-1922. During this time, the combined demands of World War I, and a new mandate to make carriages for enormous 14” and 16” seacoast guns, drove an unprecedented period of construction on the Arsenal grounds. In just five years, a total of 23 new structures were erected on over 44 acres of previously undeveloped land, and a 7 mile network of railroad tracks connected the buildings of this sprawling industrial complex. 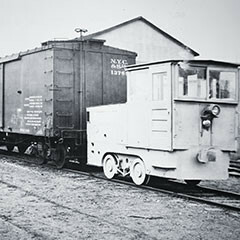 By the early 1920’s, the Watertown Arsenal had over 7.5 miles of railroad tracks used to move freight, cars, and equipment around the arsenal grounds. The production demands of World War II pushed the Watertown Arsenal to its pinnacle as a military manufacturing site. During the war the Army purchased an additional 7 acres of land that included a former Simmons Mattress factory, doubled the size building 311, and built a massive additional building at the far eastern end of the property. After the war, the primary mission of the Arsenal shifted away from manufacturing and towards research. In 1959, the Army constructed the Horace Hardy Lester experimental nuclear reactor on western end of the Arsenal grounds. The Lester reactor was the first and only experimental reactor of its kind ever to be operated by the U.S. Army. Building 97 and the newly completed Horace Hardy Lester Reactor decorated for the opening ceremony in 1960. The Army officially closed the Watertown Arsenal in 1967. It turned over 55 acres on the eastern end of the property, including the original Arsenal site, to the General Services Administration, which, in turn, sold the property to the Town of Watertown for commercial and residential development. The buildings on the 37-acre western end of the former Arsenal were taken over by the newly created Army Materials and Mechanics Research Center. Changes to the campus under AMMRC ownership included the demolition of three buildings, and extensive renovations to the remaining structures to create additional laboratory facilities and increase energy efficiency. Work in the labs focused on metals and ceramics, organic materials and mechanics, and structural integrity. 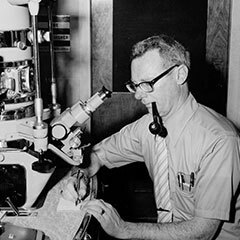 The Army closed its research facilities on the western portion of the Arsenal in 1995. After an extensive Federal environmental clean-up process, the property underwent significant redevelopment for commercial use, including rehabilitation of the remaining 10 buildings, and the addition of new roadways and a parking garage. As a part of this redevelopment process, the entire 37 acre campus, now called Arsenal on the Charles, was designated as a historic district, and a seven-acre portion containing the former Commander’s Mansion was transferred to the Town of Watertown. 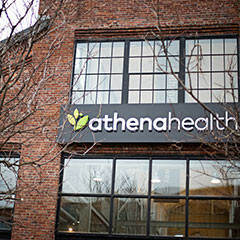 Harvard University purchased the property in 2001 and sold it to athenahealth in 2013.